The drum box application supports touch screen and keypad use. For touch screens the interface is intuitive. This section explains which keypad keys are effective during the day to day use of the drum box application. The keypad shown below is typically used to highlight and select different options on the screen. Pressing the fire button usually selects the highlighted option. When the menu is a popup menu, the keypad Up/Down/Fire keys can be used to select from the popup. The phone's select keys can "Cancel" the popup menu, and "Select" can activate the highlighted popup menu item. Where some text can be entered, pressing the fire button on non touchscreen phones changes the menu bar to show "Clear" and "T9". Pressing T9 opens up the phone's native text entry screen, this is not usually needed. Pressing the fire button again or the keypad Up / Down keys restores the menu to the screen's options (close, ....). 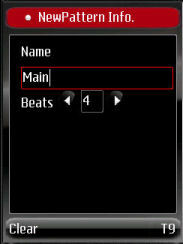 Where a screen has a list, and other input controls, such as in the screen shown, navivation is as follows: The up and down keys in the list highlight the selected name. 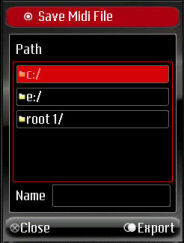 The left and right keys navigate between the list and the file name input field.